7/7/2008Share this story on Facebook! 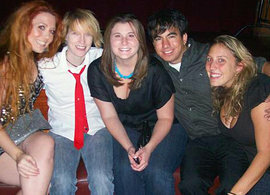 Brian Saa '08 with friends at The Ellen DeGeneres Show. The Ithaca College Los Angeles Program is an internship-based program that provides juniors and seniors a chance to gain experience in their communications concentration while getting a foot in the door of the entertainment industry. Students make valuable connections and network with industry professionals via their credit-based internships around the Los Angeles area. Classes are taught by the ICLA faculty and industry professionals at the James B. Pendleton Center, a short five-minute walk from where students are housed at the Oakwood Apartments. The Ithaca College Los Angeles Program can accommodate up to 75 students a semester, fall, spring, and summer. Get your start in show biz! "The Ellen DeGeneres Show" is just one of many internship possibilities for Ithaca College students. As an aspiring screenwriter, I was psyched about the opportunity to spend a semester in Ithaca College’s Los Angeles Program as a television studio intern. In spring 2008, I had the opportunity to intern for CP Productions and for The Ellen DeGeneres Show. The application process for Ellen was very intense. I applied in late June, two months before heading to Los Angeles, and received no response. Once in LA, I still hadn’t heard from them, so I contacted a friend who had interned there the year before. She gave the contact info for a staff member at the show, who then helped secure me an interview. A few days later I found myself sitting in the waiting area next to the show’s receptionist, and IC alumna, Susan Kraus ’06! She was a shining example of the happy atmosphere at the show, and I gladly accepted the internship. Little did I know then that the Los Angeles semester I’d been planning since freshman year would turn out to be when the Writers Guild of America (WGA) would go on strike, changing the way business ran in LA, and providing a truly unique internship experience. One of my responsibilities at CP Productions, located on the beautiful Paramount Studios lot, was to read scripts and provide coverage, a treat for a writer like myself. Coverage is when someone reads a script and provides a summary of the film’s plot and characters, and then writes a personal critique of the script, ending with whether the production company should “pass” on the script or “consider” it. If the script is considered, then it is read by a higher-up in the company. If you pass on a script, it goes nowhere. When the strike began on November 5, though, fewer scripts were coming in and more projects were being rushed into production. This changed the routine a bit; instead of asking talent agencies if an actor, director, or writer was available for production, I had to ask if they were available “pre-strike” or “post-strike,” a difficult task since no one knew when the strike would end. Occasionally there were picketers outside Paramount distributing fliers listing WGA demands. When I would pass them by, I’d wish them luck and be on my way. Production on the show naturally hit a few snags as a result of the strike. Some celebrity guests cancelled appearances due to their alliance with the WGA, which left the staff scrambling to book new celebrity guests, sometimes within hours notice. While the full-time staff handled that, the interns were busy letting the audience know about the guest changes or helping to find more human interest stories to take the place of the allotted guest spots. The Ellen DeGeneres Show was one of the few shows that continued running despite the strike. It was a very interesting time to be an intern. I wanted to make a good impression at my internship, but, at the same time, I didn’t want to snub the members of the union I will one day join. There were times when I was torn between the two. Luckily, the Ithaca College LA staff was there to remind me that I was an intern and the writers would not hold it against me. Even to this day I have a fear that future employers in Los Angeles will look down on the fact that I worked at a show that crossed the picket lines. Despite these hurdles, the Ellen internship was one of the greatest experiences of my life, and I am truly thankful to have worked there. In February, to the joy of studio executives, television and movie fans, and myself, the strike finally ended, and I finally got to see what LA was like when there was no strike affecting the industry. Sarah Hathaway ’09, a fellow Ellen intern, said that she was able to see a difference in the creativeness of the monologues and the amount of celebrity guests on the show. It was amazing to see that after such a long struggle between writers and producers, everyone was able to go back to work the day after the strike ended and conduct business as usual. You know what they say: the show must go on.